This is why the National Defense Authorization Act(NDAA), which was contested by me and three other plaintiffs before Judge Katherine B. Forrest in the U.S. District Court for the Southern District of New York on Thursday, is so dangerous. This act, signed into law by President Barack Obama last Dec. 31, puts into the hands of people with no discernible understanding of legitimate dissent the power to use the military to deny due process to all deemed to be terrorists, or terrorist sympathizers, and hold them indefinitely in military detention. The deliberate obtuseness of the NDAA’s language, which defines “covered persons” as those who “substantially supported” al-Qaida, the Taliban or “associated forces,” makes all Americans, in the eyes of our expanding homeland security apparatus, potential terrorists. It does not differentiate. And the testimony of my fellow plaintiffs, who understand that the NDAA is not about them but about us, repeatedly illustrated this. 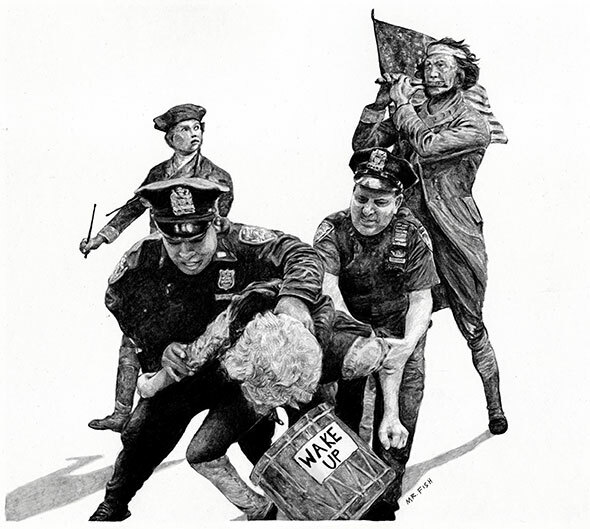 This entry was posted in civil liberties, crime, Justice, law, Occupy, protest, protests, Terrorism and tagged Alexa O'Brien, Birgitta Jónsdóttir, Chris Hedges, Day of Rage, NDAA, security state, Stratfor, Truthdig, WikiLeaks. Bookmark the permalink.